How much does Bryant & Stratton College - Akron charge for tuition today, and how much are charges estimated to shift? How does this rival other colleges? Read on to find out. Understanding the tuition related to going to Bryant & Stratton College - Akron lets you plan a budget for 4-6 years. Check out the numbers following to know how Bryant & Stratton College - Akron's price measures up to other colleges and universities and if you need to prepare for a rise in tuition. How do Tuition & Fees at Bryant & Stratton College - Akron Measure Up To Other Colleges? For nationwide, regional and statewide comparisons, look at the table below to find out how Bryant & Stratton College - Akron compares to other colleges. How Much Does Bryant & Stratton College - Akron Charge for Tuition? Full-time undergraduates at Bryant & Stratton College - Akron were charged $19,094 in tuition and fees in the 2017 - 2018 school year, prior to adjustments for financial aid. $17,949 was the cost of tuition. $1,145 was fees. As opposed to state schools, Bryant & Stratton College - Akron doesn't offer reduced tuition to students who live in state. Tuition and fees take care of the expense of attendance for one year of school, but do not include room and board, which is an extra charge you will get if you decide to stay on campus. Bear in mind many students obtain financial aid and scholarships that decrease their total cost. There continues to be a rise of 3.8% in Bryant & Stratton College - Akron tuition and fees for out-of-state students in the past five years. Tuition increased by 2.3% and fees increased by 41.4%. This school year, students can anticipate paying $19,814 based on current projections. Because of price growth, the total expense of a four-year Bryant & Stratton College - Akron degree would be $83,851, and the total cost of a two-year degree would be $40,375, not including extra costs for books, transportation, and room and board. 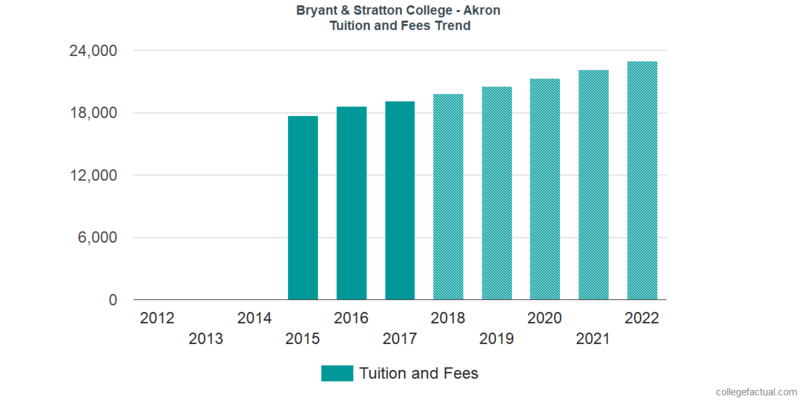 Take a look at the following chart to find out how Bryant & Stratton College - Akron tuition and fees might develop in the years to come. At many colleges you'll wind up paying out more in your final year of school than you will in your first. This is due to yearly cost growth. It pays to be in the know!